At the time of his passing earlier in the year, iconic comedian Robin Williams left behind four finished films that had not yet been released. A Merry Friggin' Christmas debuted early last month, and Night at the Museum: Secret of the Tomb is in theaters this Friday. In 2015, we will see him in Boulevard opposite Bob Odenkirk, and we'll hear his voice in his final completed role as Dennis the Dog in Absolutely Anything. 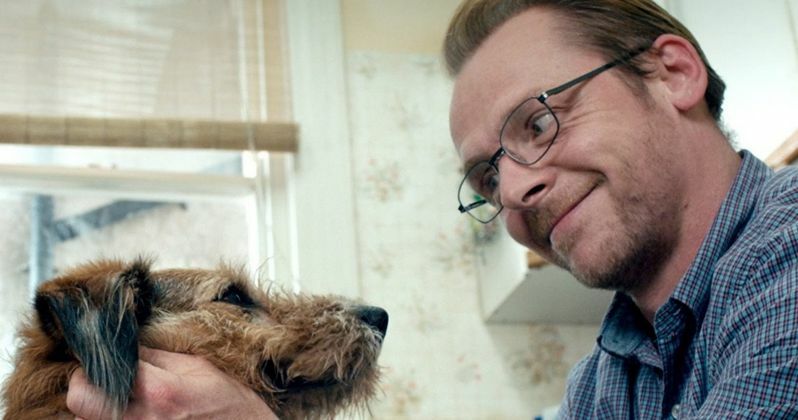 While neither of these movies has a confirmed U.S. premiere set, we do get a first look at Dennis in a just released clip from Absolutely Anything. Monty Python alum Terry Jones directs Absolutely Anything, which follows a schoolteacher named Neil (Simon Pegg), who is given the incredible power to make his every wish a reality by a group of aliens. Neil demonstrates some of those powers in this sneak peek, which begins with him devouring a vast amount of knowledge while he devours his breakfast hands-free. Looking for a little bit of help, he turns to his dog Dennis. Robin Williams voices Dennis as a canine obsessed with Biscuits. Sweet in nature and looking only to please his master, Dennis, like any dog, is easily distracted by doorbells and snacks, even when he's gifted with the power of intelligent thought. Take a look, and say farewell to Robin Williams in a movie that also features John Cleese, Terry Gilliam, Michael Palin, Kate Beckinsale and Eddie Izzard.